We’ve told you time and time again about how awesome LED backlight kits are for TVs. The concept is simple but the impact is profound. 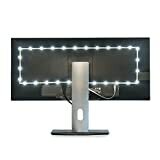 These LED light strips attach to the back of any TV and then plug into an open USB port. Anytime your TV turns on, the backlight turns on as well and casts a beautiful glow onto the wall behind your TV. The effect is fantastic whether your TV is mounted on the wall or standing on a media console, and the best part is that these LED backlighting kits are so affordable. In fact, one of the most popular options out there is even more affordable than normal right now thanks to a BGR exclusive deal. Use the coupon code BGVC6GVR at checkout to get the 78-Inch Luminoodle TV Bias Lighting Kit for just $10.49. You read that correctly… under $11. You’ll completely transform your viewing experience and anyone who sees it will be blown away. Seriously, we can’t count the number of times people were wowed by ours, and they always want to know where they can get a kit for themselves. BEAUTIFUL GLOW: The Luminoodle’s high quality, true white LEDs can turn any TV room into a beatuiful home theater area, adding a comforting glow to the room. INCLUDES: 78 inch (2m) LED light strip (6500 Kelvin) with 3m adhesive that plugs into your TV’s USB port. *Input: 5W (5V, 1A). Please check USB output prior to use.